Loretta Devine, who plays civil rights activist Jo Ann Robinson in ‘Behind the Movement,’ discusses how far we’ve come since the Montgomery bus boycott, and how the internet has changed civil rights activism. Larry King - Have we come a long way? Loretta Devine - Well, we can get on the bus. Larry King - That's about it, huh? Loretta Devine - I don't know where it's taking us, but we can get on it. Larry King - We almost elected that judge. Loretta Devine - To me, I can only speak for myself, we go forward, we go backwards, we go forward, we go backwards. There are so many people that are successful in living, in my race, that are successful in living the dream, and there are so many others that are left out. It took 52,000 people that were in Alabama at that time to make this boycott work, and it wasn't just about the buses. It was about the cruelty, about people being arrested, about people having to pay fines, people not feeling like they were human, you know, indecent treatment. So, it was more than about a bus, and I think that's the other thing that people learned from this. So, the fight that, the racial fights, and the thing that's the hardest is when it's part of the law, when it's law to be unfair to someone, they don't feel like they are men or women or have dignity, and you have to have that for your children. Larry King - We still have laws about redistricting. 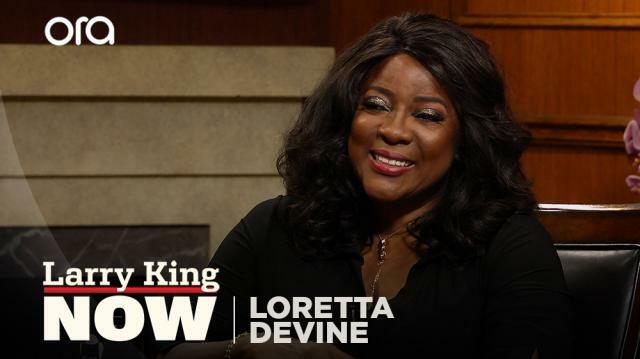 Loretta Devine - Yeah, there are so many things that need to be fixed and changed. Larry King - Where did you grow up? Loretta Devine - Houston, Texas. Larry King - That was a segregated city. Larry King - I knew Barbara well. What a great woman she was. Loretta Devine - Yes. Always fighting for change. You know, it's the fabric of this country. You grow up with a submissive attitude. You learn to follow the law, to try to stay out of the way, to keep your eyes down, and that has been a part of the history. Well, those things aren't working now because our young people are all growing up on the Internet. Everybody feel like they're entitled to what everybody's entitled to, so it's a new world. Larry King - Shouldn't they know more about Barbara Jordan? Loretta Devine - I feel that that's true. Larry King - What a great lady she was, almost forgotten. Loretta Devine - Very great lady. Someone has to do her story as well.